In 2014 I reviewed the first two works in a series by Felicia Fox which told the most amazing story involving a Succubus. You can find the review of Consumed here, which I loved dearly and the review of the second work Captive, can be found here on the Tale, was, again, a wonderful read. 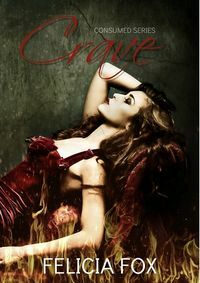 The last work in the series, Crave, has been out for some time now, and today I shall be reviewing the work on the Tale. The thing about not knowing everything is that there are some secrets, when revealed, which show just how tangled the past can be. Some secrets shouldn’t be held closely when they can mean the difference between life. love, and, sometimes, loss. Felicity finds herself held by a madman, who reveals just how mad he is, all of the things that he has done to her, and what he desires from her. Alex seeks out Felicity, her own truths and the hidden ones about Felicity that neither of them knew, or understood. They say the truth can set you free, but for Felicity and Alex, is there such a thing as freedom or is it all in their minds? Overall, the work ties up a lot of loose ends and in doing so it gives explanations about a lot of Felicity’s past and of Alex’s as well. In doing so there are a lot of “well that makes sense” moments and really that’s very good because sometimes there are tales told about histories that make no sense. Here, the history is important, it matters and through that history it isn’t just Felicity that comes to understand, it is Alex as well. In learning about now so much who Felicity is, but what she means to Alex’s society there comes a moment where an important question is posed to Alex. It’s one that really does matter and while it takes some time for her to figure it out, it does make a world of difference to Felicity. There’s some betrayal, some conflict, and there’s a certain amount of… worship… that comes from the truth. It explains so much about why things turn out as they do, but it also gives a certain hope that Alex’s society can be more than it is in this moment. There’s a past, one that still exists according to some, and it isn’t the best of one. For me there was a bit of disappointment in how Marius’ story turns and comes to a close. It felt rushed in a lot of ways and with all that transpired through this series and how much Marius had his fingers into so many things, that resolution was… too pat. It wasn’t unexpected by any means, but I wanted more from this aspect of the series. Yes, there’s no doubt that we understand a lot through Felicity’s eyes as Marius reveals so much to her, but… something’s missing beyond that. Something wasn’t explained and that left me with something of a black hole in the story which I didn’t like to see. What wasn’t a mystery was the love between Felicity and Alex. It is as strong, if not stronger than in the previous works. That love is the undercurrent that sweeps through all of the characters, making them take notice of what they have done, right or wrong. The passion in the scenes between Felicity and Alex is wonderful and the teasing moments bring a bit of light to the work when it’s sorely needed for all of the darkness that surrounds both Felicity and Alex. Amazing writing, the characters remain true to themselves from start to finish. There’s nothing to draw the reader out of the story and the tapestry of Felicity’s truths, as they are revealed are gripping. As strong a work as the rest of the series and, as a whole, a very satisfying ending. While this work closes out the story of Felicity and Alex and their world, there still are a lot of questions left open to explore. I really would like to see more from this world, to see where Felicity and Alex go from here. I’d like to see how Alex’s relationship with her father and as well the surrounding society she lives in are changed by the revelation of who, and what, Felicity is. I’d like to know the future turns of events that come from everything that has happened and will, there is little doubt, come from this. There’s more story here, more passions, more life to be lived. I do hope the author does, sometime, return to tell more. So, it is not “the” story of Felicity and Alex that is completely told, but this story. There is not only love and passion, but hope one can count on.